Illinois Auditor General Frank Mautino again has failed to respond to questions from state legislators regarding federal and state investigations into allegations he misused campaign funds while serving as a state representative. It's the fourth time Mautino has chosen not to respond to state legislators' inquiries since January, when news broke that federal authorities had launched an investigation. State Sen. Laura M. Murphy (D-Park Ridge) has asked Mautino to voluntarily take a leave of absence until federal and state investigations are resolved. More recently, 20 Republican House members issued a House Joint Resolution (HJR 158) calling for Mautino's resignation. "The state auditor general has now confirmed that for one reason or another he does not want to share information regarding investigations into his alleged misuse of campaign funds," Kay said. "Only he can answer those questions, and apparently he has chosen not to do so." Mautino has been under fire since January when news broke that the FBI had joined the State Board of Elections in launching investigations into his alleged misuse of campaign funds during his 24-year term as a state representative. "It seems to me it would be very difficult to fulfill the responsibilities of the state auditor general's office while at the same time being the subject of investigations by both state and federal authorities, but he has decided to do just that," Kay said. 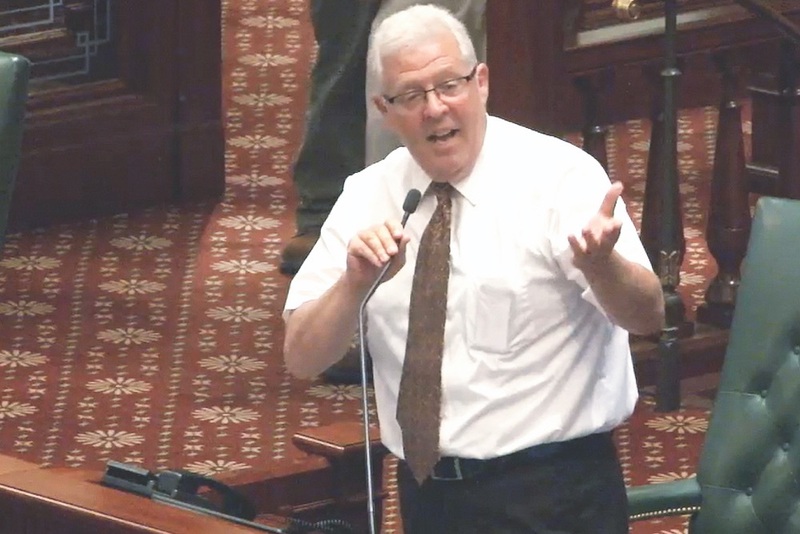 Kay added that House Republicans will pick up the issue of HJR 158 again when General Assembly members return to Springfield in November for the annual veto session. He also noted that a similar movement to issue a resolution calling for Mautino to resign is underway in the state Senate. "We all presume a person has the right to due process, but in this particular case it may take a little longer than one would want given all the information that has been published in the press is correct," Kay said. Correct or incorrect, the state auditor general should come out and respond to legislators' inquiries, he added. "Given there's so much interest in the General Assembly on both sides of the aisle, it would be interesting were a member of the press to contact the house speaker and provide information as to his intentions regarding HJR 158," Kay said. Mautino was a staunch supporter and right-hand man for House Speaker Mike Madigan during the 24 years he served as a state representative. Murphy said that she has not been in contact with Madigan regarding HJR 158, or calls for Mautino to resign or temporarily step down. She added that to her knowledge the House Speaker has not issued any statements in that regard. In response to pointing out that official requests calling on Mautino to resign have come exclusively from Republican General Assembly members, Murphy said: "I don't think it's a partisan issue. It's an issue of right and wrong." Murphy added that she is waiting for Mautino to respond to her request that he reply to questions and step down until the federal and state investigations are resolved. If he does not, Murphy said she expects to initiate an official call that he do so on the part of state senators.